At the Natural Products Expo, we cast our hungry eyes up and down the aisles seeking interesting new products for vegans. Seven years ago, we attended this show in Washington, D.C., and this year’s show seemed at least triple in size and scope. The show featured supplements, products for the home, pet foods and supplies, health and beauty items, and of particular interest to us, vegan foods and products. It was exciting to see so many companies, young and old, putting their resources behind their ideas. From among many contenders, I chose five to write about. 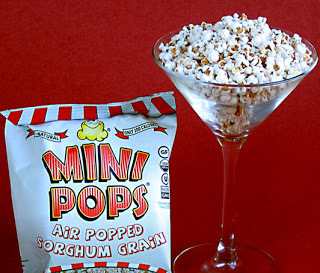 Mini Pops (air-popped sorghum grain). Think popcorn the size of little peas and that’s popped sorghum (shown in photo above). These certified organic crunchy treats are tasty, with a hint of “subatomic” sea salt, and only 100 calories to a one-ounce bag. They’re made in a nut-free facility. PS. Farming sorghum uses half the water required for farming corn. Luna and Larry’s Coconut Bliss. If you’ve never tasted Coconut Bliss non-dairy frozen desserts (the top seller in the U.S.), then you should treat yourself as soon as possible. They have over twenty flavors, they’re award-winning, and they aren’t kidding about the bliss. I think you can find these most anywhere now. Salazon Chocolate Co. Billing itself as the first salted-chocolate brand, it was easy to see why it’s so popular. The salt gives the organic dark chocolate a college degree, flavor-wise. The products are USDA Organic, Rainforest Alliance Certified, and the company is a member of “1% for The Planet.” They make chocolate with salt and pepper, coffee, and other tempting ingredients. Do go online and find out where you can buy these delicious bars. Sophie’s Kitchen. Some vegans eschew faux meats and others love them. If you like them, look for Sophie’s vegan seafood products. They’re 100% vegan, non-allergenic, free of trans fats, and contain no preservatives or artificial anything. They offer Vegan Calamari, Breaded Vegan Shrimp, “Fish” Fillets, and even “squid” rings. Some of the products are gluten- and soy-free. By far, the stellar highlight of our trip was the dinner we enjoyed on our way home at Great Sage, the fabulous vegan restaurant in Clarksville, MD. The place was filling up by 6pm, the food was excellent, and the staff knowledgeable and friendly (Hi Courtney and Amy!) That’s all I’ll say about Great Sage as I know Robin plans to review the compassionate eatery soon on her own blog, VeganPlanet.